I love the World Cup. I played soccer for 12 years and I remember watching Briana Scurry take on China in overtime penalty kicks in the 1999 final match. I’d recently taken up goalkeeping for my U-10 team. I watched the U.S. tie Sweden at the Canada games last weekend, and I spent the game telling my friend about the ’90s team that probably inspired this year’s team to keep playing soccer, even though the U.S. cares little for the sport, especially the women’s version. I told her they’ve inspired young soccer players since the U.S. team won the first Women’s World Cup in 1991 and the 1996 Olympics. It was the first Olympics that included women’s soccer. If you don’t already know, role models are an important part of life, and I learned this in 1999 when I was scared to dive for a ball in the goal. Briana Scurry showed me how important it is to overcome that fear to be a good goalie. When I took up rock climbing in college, I was just having fun with my friends. I didn’t think much about getting to know the greater climbing community and its history. Someone at the gym mentioned Chris Sharma, and I pretended I knew who they were talking about. That has changed recently – especially since I started reading rockclimbingwomen.com. That old admiration for experts has lit a new flame. I’m intrigued by stories of climbers reaching new limits like Tommy Caldwell and the Dawn Wall in January. And I love learning more about how other people push themselves, as in the RCW interview with Lynn Hill and this old Rock and Ice piece on Sasha DiGuilian. I don’t think it’s up to professionals to climb while we watch. It’s one of the reason’s I enjoy the climbing culture: Participation runs the spectrum. I can be inspired by stories of people who, like me, don’t enjoy brand ambassadorships or live out of a van and climb like it’s their job. I want to read those stories. 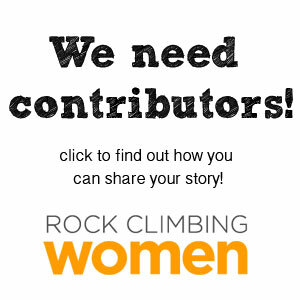 In fact, I want to edit those stories – please send us yours so we can build a body of work written by and for climbers of all backgrounds, interests, and skills. But I believe in role models. Role models have to be visible, active, tested. I’ve found countless high caliber accounts on Instagram by climbers I can admire and I read more climbing news than ever before. And like my 9-year-old soccer playing self, I have found someone to show me the fun that lies ahead if I keep at it.